We have all been witnesses of a great fight between Mercedes and Ferrari on Sunday, either on track and also in terms of strategy. The race has been decided by a couple of circumstances that favored Mercedes rather than Ferrari, given that the performance on track of the two cars was pretty similar with the advantage for Ferrari of having gained the lead out of turn 1. It is worthy however to point out that until this Grand Prix the SF70H had proved to be the car to beat on the race pace (also in Sochi) while in this weekend Mercedes, also thanks to the updates brought on track, seemed to have bridged the gap. A gap that in qualifying has been instead reduced by Ferrari in the Russian GP and completely eliminated on the outstanding circuit of Montmeló. Let’s go then to analyze the race by trying to focus our attention on the highlights of this Grand Prix. The race started in the best way possible for Vettel who, thanks to a very good start, on the dirty side of the track got ahead of Hamilton (who seemed to have troubles in the start). Given that the "poor" getaway of Vettel has been the main cause of the missed win in Sochi, the engineers in Ferrari have worked hard on this aspect both at the simulator and on track during the filming day on the track in Mugello. On the SF70H of Sebastian Vettel we noticed a new lever for the clutch, similar to that utilized by Mercedes that, coupled with a new software (installed also on the SF70H of Kimi Raikkonen), provided to the German driver a good sprint to pass Hamilton. Raikkonen too did a good start but due to a contact with Bottas (the best at the start) has been forced to retire together with the Red Bull of Verstappen. An accident that has, correctly, not been sanctioned by the stewards. 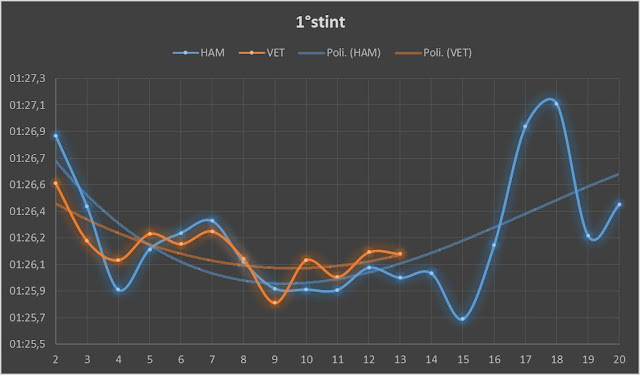 The graph below is quite significant: the SF70H of Vettel is the car that has been able to exploit in the best way possible the soft tyres until lap 8 being constantly quicker than the W08 of Hamilton. 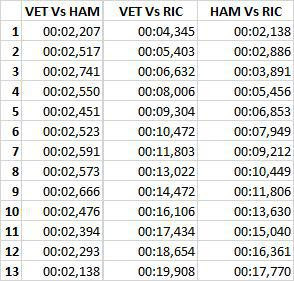 Unfortunately Vettel has not been able to create a substantial gap to be in a safe position for the pit stop; as you can see in the table below the largest gap between Vettel and Hamilton was reached during lap 7 with 2,501 seconds of advantage. Second, open a gap of 22-23 seconds on the RedBull of Ricciardo so to be able to do the pit stop and keep the position, without impediments in the first laps on the new tires. During lap 13 the gap had reduced nearly to 2 seconds with Vettel who has not able to match the excellent lap times of the Mercedes driver and the box of Ferrari that, knowing the intention of Mercedes of pitting in the subsequent three-four laps, opted for a correct anticipated pit stop. 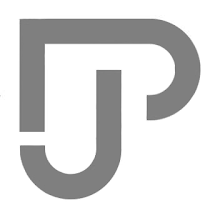 A defensive choice made mainly to maintain the leadership of the race. Sebastian Vettel who, after his pit stop, found himself behind Ricciardo. This has not been a problem thanks to the new Soft tyres and the DRS, factors that helped him a lot in the overtake. SPANISH GP: could Ferrari have opted for Medium tires instead of the Soft ones? This is an appropriate question given how the race finished. In our opinion the choice of using Medium tires could have been quite risky for Ferrari. There are two main questions: first, what would have been the lap times of Vettel? Would they have been good enough to avoid the undercut of Hamilton, given that his tires were yet doing pretty well? Second, would the overtake on Ricciardo have turned out to be as easy as actually was with a different compound? 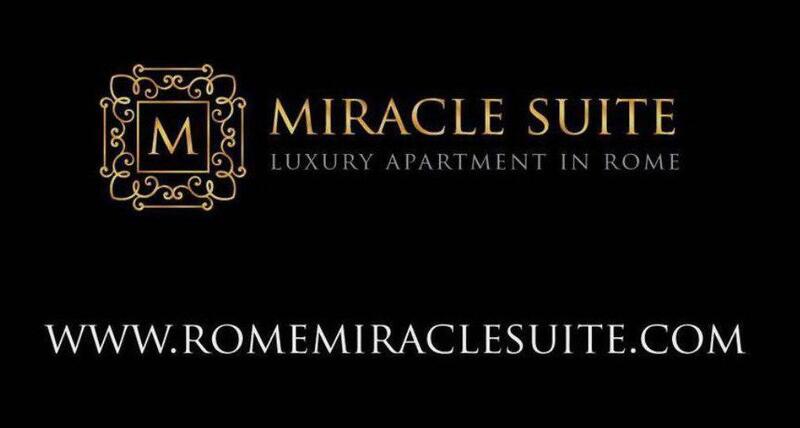 For these reasons we consider correct the strategic choice of Ferrari. The choice of Mercedes of keeping the W08 of Bottas on track, was quite obvious. Nothing illegal and/or unfair. The Finnish driver was managing his race trying to do only one pit-stop and trying to finish on the podium. 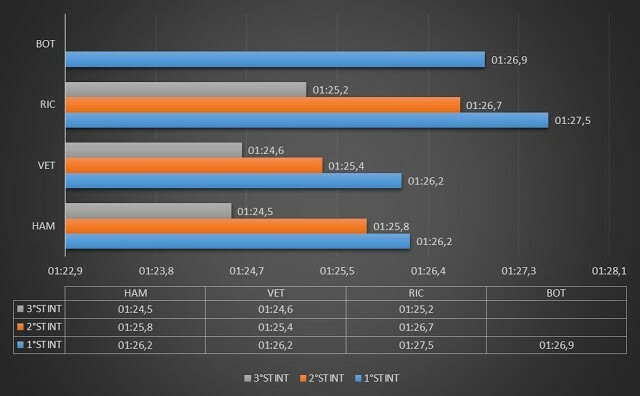 It is evident that his pace had “slow down” Vettel who, for some laps, has not been able to use the full potential of the Soft compound losing more or less 5-6 seconds while Bottas was allowed to use the famous extra boost of power (available during the race for both Ferrari and Mercedes). The Finnish driver has been then forced to retire, because of an issue occurred to the turbocharger of his Power Unit. This retire was probably caused by the fact that in Russia his car used too often the extra boost of power to avoid the overtake of Vettel. That Power Unit should have been used only on Friday during free practice but, because of some problems during the free practice 3 on the new Power Unit, the team has been forced to use it also on Saturday and Sunday. In the second stint of the race it is possible to notice how quicker was the Soft compound on the Ferrari of Vettel with respect to the Medium compound on the W08 of Hamilton. A difference that can be noticed also during the last stint, when Vettel was on Medium tires and Hamilton was on Soft tires. In this part of the race we should however underline that Hamilton was managing his tires because Mercedes scheduled a possible Plan B, which consisted in finishing the race in that compound. Choice that after having analyzed data at the end of the race, was not impossible at all (for instance Force India did 33 laps on these tires with a really low decline). 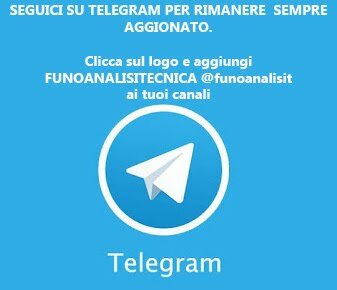 If we observe “the attack times” it is possible to notice that they are similar to those recorded at the end of the stint, signal that the theoretical 45 laps that Mercedes should have done were not an utopia. 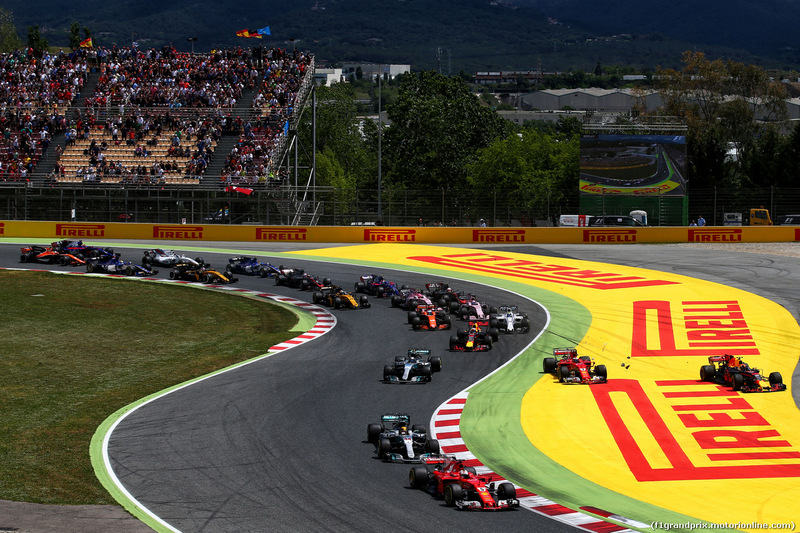 SPANISH GP: did the VSC play a decisive role? Yes, the VSC has been decisive and has determined the outcome of the race and Mercedes has been very smart in taking advantage of it, finding themselves however in a better strategic position at that moment, being able to decide if to continue with the Medium compound or change it with the Soft one. Mercedes has been smart in waiting the last moment possible to take this decision because they expected the pit stop of Vettel and, if it would happened, they would have tried to finish the race on the Medium tires forcing Vettel to an overtake on track. Seeing that Ferrari did not "pit", Mercedes decided to change strategy and to call Hamilton back to the box. Thanks to the VSC the pit stop costed to Mercedes 8 seconds less than Ferrari. The other very intelligent strategic decision was to do the pit stop in the last seconds of the VSC not allowing so the response of Ferrari in the following lap. 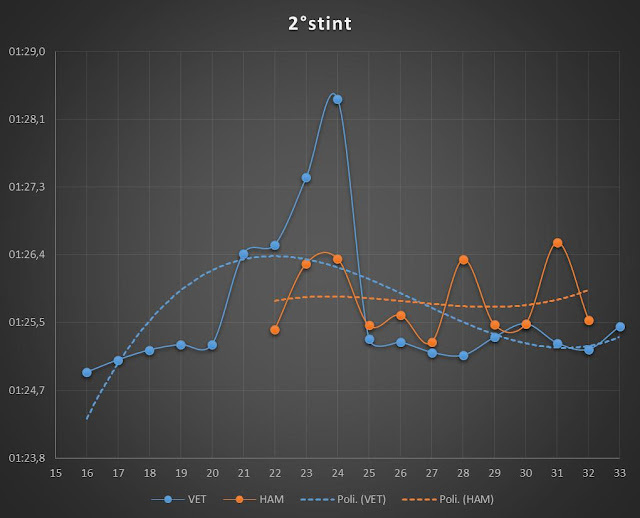 As we described above, Mercedes had an advantage in terms of strategy: if Ferrari stopped to change tires, Hamilton would have gained the 1st position and he would have finished the race knowing that Vettel too was on Medium tires, slow compound that ensured however great regularity: this amounts to say that being on new Medium tires or used Medium tires do not change too much. If Ferrari did not stop in the first laps of VSC, having the advantage of having a new Soft compound available, it would have been correct to opt for Plan A (two stops, Soft - Medium - Soft), gaining the position on Vettel on track. The Soft tires of Hamilton made the difference with respect to the Medium tires of Vettel. The English driver, thanks to the DRS and to the extra traction of the Soft compound out of the last chicane, has been able to pass Vettel quite easily. An important role has been played also by “the extra power button”, but this is used also by Ferrari during the critical moments of the race. The numbers confirm it: Hamilton with the DRS opened reached a 334 km/h top speed while Vettel reached a 332 km/h top speed during the overtake. Quite close. 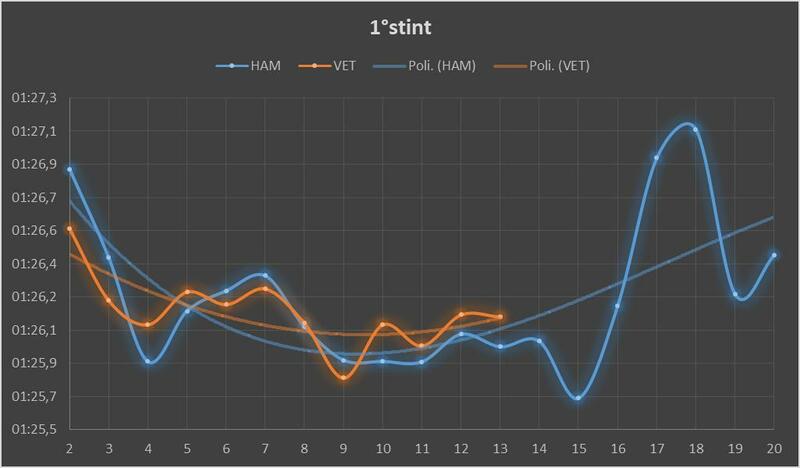 Gained the leadership of the race, Hamilton tried to create a gap on Vettel such that if he stopped and continued the race on Soft (used tires), Plan C of Ferrari, it would have allowed the pit stop to English driver. From lap 55 on, with a gap greater than 4 seconds, Hamilton was focused only in managing tires and Power Unit. This management has been interrupted during lap 64, when he completed his personal hat trick recording the fastest lap of the race. 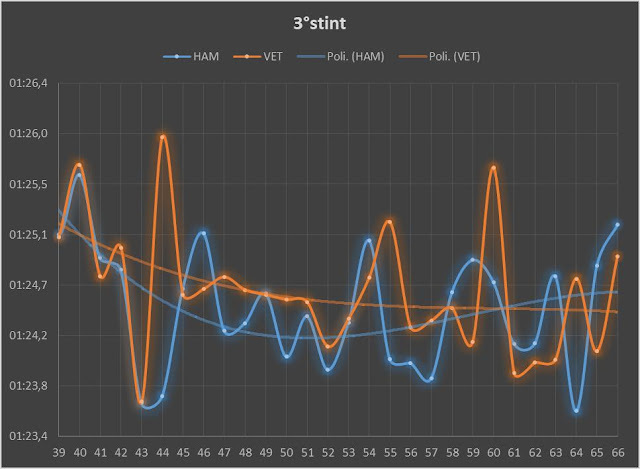 It is possible to see, by analyzing the race pace, that the performance of the SF70H has been quite similar to the one of the W08 in this race. The updates introduced by Mercedes, we talked about it on Friday, aimed at helping the W08 in the management of tires during the race rather than trying to improve pure speed. This in fact worked but this is not the end because we yet need to find out if the W08 will be as gentle on the Low Working Range tires as on the High Working Range ones. Ferrari leaves Spain with a sense of bitterness because the car proved again to be very performing but, also because of some unlucky circumstances, Vettel did not manage to score the hoped 25 points. For sure, as said before, the step forward of Mercedes with high temperatures (>40 degrees) is evident proved also by the fact that the SF70H has not been able to create a gap at the beginning of the race, forcing its engineers to a defensive strategy.